Today’s card is for one of our nephews, who will be 15 on Friday. 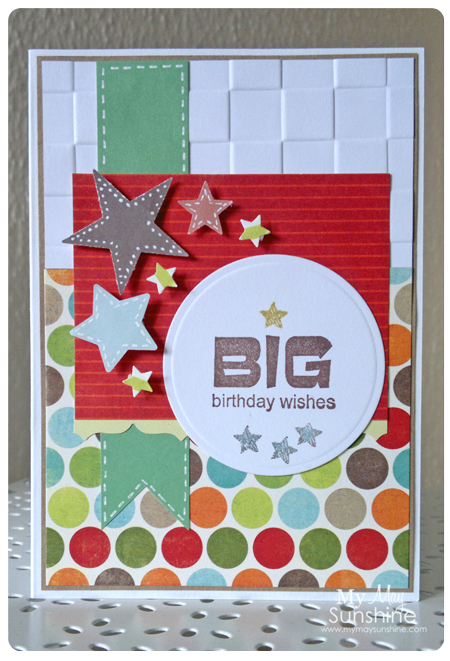 I decided to use the Mojo Monday Sketch 252 to create the card. I needed to keep this card pretty flat as I needed to mail it so I decided not to use any ribbon, twine or buttons and keep everything flat but just put the stars on some dimensionals. As there was lots of colours and patterns, it didn’t really miss the ribbon etc. On the background, I used an embossing folder. I got it all straight to go in the Cuttlebug machine but when I went to put it on the card, it wasn’t straight. Typical. Never mind. Paper – My Minds Eye Lime Twist Fly a kite and Dovecraft coloured paper | Stamps – Amy R It’s your birthday and Banana Frog Super Star | Spellbinders Nestabilities Classic Circles | Border punch – Fiskars Upper Crest | Embossing folder – Tri boss chequered | Sakura white gelly roll pen | Versamagic and Colorbox chalk ink.